Though the attack phrases were still very much a part of the manga, it’s a bit harder to gauge whether or not the Sailor Soldiers also need to assume certain poses in order to attack since there’s obviously no motion on page. I’ll leave that interpretation up to you, dear reader, but my belief is that they probably do make poses to attack, though they’re probably less involved than the anime. The easiest and quickest response to this question of why they call out their attacks would be to say that it’s because Sailor Moon is heavily based on the tokusatsu formula,1 which is pretty well known for its absurd attack names and action poses. That’s probably one reason why kids on the playground love it so much. But are these attacks just a way to make a cool gimmick for kids to imitate? Is it a trick to cut down on animation time and save money? Are the phrases even necessary to perform the attacks? Well, my cynical friend,2 while I can’t answer the first two questions – though could you really blame the producers if the answer to them was “yes”? – I can answer the third. We’ve actually seen on several occasions in the series that it’s not necessary for the Sailor Team to perform their moves or shout out their attack phrase in order to attack. Makoto, Minako, and Rei all show this in the final showdown at D-Point,3 though there are plenty of other occasions. So if they don’t need to call out their attacks, then why do they? This is all a part of a Japanese safety standard known as Point and Call (指差喚呼; shisa kanko),4 method for improving safety by requiring a person to physically indicate what they are doing in addition to physically pointing in the direction they are looking in order to make them focus on the task at hand. The concept was first put into policy by the Kobe Railway Administration back in 19135 and exploded across Japan from there, before moving out to Taiwan, China, Korea, and other parts of Asia. 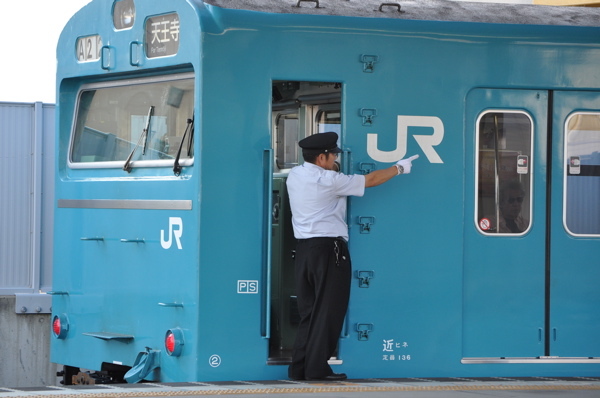 While this is most typically seen in pop culture in the context of the train industry,6 with the conductors and station staff waving their arms about wildly and shouting out phrases as the trains come and go, it’s actually pretty common throughout a lot of Japanese life. Anecdotally, I had to indicate verbally and point out every direction I checked when getting a Japanese driver’s license, and they encourage you to do it even at home. Also, when going through CPR training in Japan, they tell you to shout out each step to keep track of what you’ve done and what you need to do next. Since you’re putting in all this effort, is it actually effective? Yes, and very much so. Read also: Was Naru Intended to Be a Bigger Part of Sailor Moon? So what does safety protocol have to do with thunder crashes and moon tiaras? While occupational safety is one of your last concerns when unleashing death upon your opponent, you have to admit that it must take a high degree of concentration to focus these powers into the highly directional attacks that you see in the series. Indeed, in the times where you don’t see them go through the motions (such as the aforementioned battle against the D-Girls), the attacks are unfocused blasts of energy. Secondarily, and especially with regard to sentai series, I think you could make a good argument that the call out their attacks also as a way of keeping the other members aware of what’s going on – much like a SWAT team member would shout when his room is “clear,” or a basketball player would yell that she’s “open.” If I know a Fire Soul is blowing through, I would probably act different. So, what do you think of all this? Do you think that the special attacks are just an artifact of Sailor Moon being an anime, or do they actually serve some sort of deeper purpose? Something else? Obviously, there’s no right answer to questions like this, but it’s nice to think there’s some sort of deeper purpose! 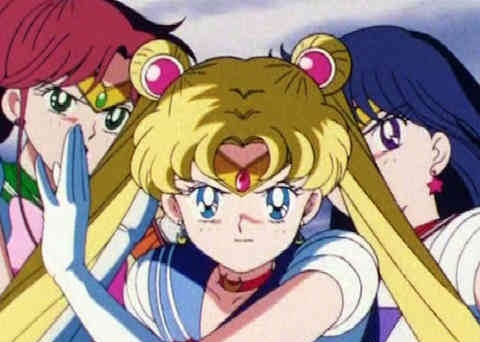 ← What Crossovers Did Sailor Moon Have With Other Anime? The transformations, on the other hand, those don’t work out so well for those of us without a keen sense of balance. Too much spinning! Pssh, I do that like 3 times a week, usually in my sleep. More yoga! Disclaimer: I cannot do yoga. It would kill me. This whole thread had me cracking up. And I was one of those kids on the playground mimicing the attacks. Supreme Thunder was always a tricky one…. The real question is: was it more embarrassing to just do the moves and not call out the attack out loud (leaving those around you wondering what’s wrong with you), or to go all in and shout the attack? From what I’ve managed to put together, and bare in mind this just my interpretation. That as well as being rooted in ancient martial arts, calling out your attack somehow puts a bit more energy into it. Like psyching yourself up, or a momentary adrenaline rush. In certain sports, yelling or roaring can give you a bit more power. Such as shot-putting. Which leads me to wonder. What was the first Anime or Tokusatsu to popularize the attack calling trope. The earliest I can think of is Kamen Rider. I actually researched this – seriously, I live for this stuff – and found the earliest known reference, but it wasn’t relevant to the article so I left it out. The earliest reference to a 必殺 (hissatsu) technique is Nemuri Kyoshiro from 1956. Possibly pre-dating that is the 忍法 (ninpou) magic used in the Edo-era novel Sawada Ten Braves, but since I’m not sure I’d make too much of this connection. Another awesome article! Thanks! I had thought about all of this before, always explaining they do this in fast motion and the anime just makes it seem slower like Matrix, you know, for us to enjoy the movements. But this is great information to add to my explanations in the future haha. The work-as-a-team part, yelling “here come’s the ocean blast, move away!”, so the other Sailor Guardians are not harmed. And the cultural knowledge about Japan is great too! Thanks! For the transformations especially, I think the slow motion (for the sake of the viewer) thing makes a lot of sense. I believe on several occasions they’ve been attacked immediately after transforming (though I don’t have any episode numbers off the top of my head), so it doesn’t make sense that the enemy was standing around and waiting for the Sailor Team to finish up before striking. I know lots of other people explain it away as a sort of magical force-field around them, or that they teleport elsewhere when transforming (hence the multi-colored, space-style background), but I feel like this is something that would have to be addressed it if were the case. I mean, if you’re invincible in the field of battle, don’t you think someone would mention it, or Zoisite or someone would have tried to attack? Oddly, this issue has actually been scientifically discussed on a Japanese TV show. Whenever I hear the words “Japanese TV” and “science” put even remotely together in a sentence, I die inside. I’m sure this article/program had something interesting to say, not doubting that! But Japanese TV is so wildly inaccurate and unconcerned about facts that it’s quite hilarious. =p It’s 95% old wives tales and baseless rumors. Just a few weeks ago, they had a guy in a doctor’s coat on screen talking about how you need to be careful of standing outside in the rain, or you’ll catch a cold. I know this is totally off topic, but just a fun FYI about Japanese news reports! Sounds a bit like Fox News in that respect. If we’re going of topic, I’m wondering if you are familiar with this “interesting” clip. You know, for the longest time I thought that was some sort of gag video made in Japan and then got picked up in the US. But nope — it was totally a legit program that ran on Fuji Television titled 英会話体操Zuiikin’English (English Aerobics Zuiikin’English), and ran in 1992. Yeah as far as the transformation time I’m pretty sure that 3×17 pretty much answers that, we see Neptune transform from Haruka’s perspective and it’s pretty much instantaneous. A big flash of blue energy/light envelops her and transformation done in under 2 seconds (about the same time it takes Haruka to de-transform in 3×26 ) with no visible posing, waves crashing, or outfit appearing piece by piece. 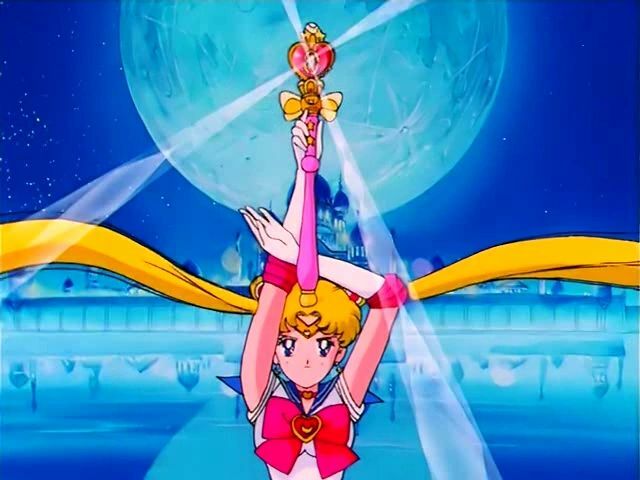 We see something somewhat similar in 5×04 when Usagi turns into Eternal Sailor Moon from the perspective of her friends with her being covered in a big pink glow and transforming far quicker than normal without most of the feathers/posing typical of her sequence (although we still get a portion of the traditional sequence slowing things down). It happens again even more likely in real time in episode 5×06 where she instantaneously transforms in under 2 seconds with a flash right before she does whatever she does to Nehellenia. 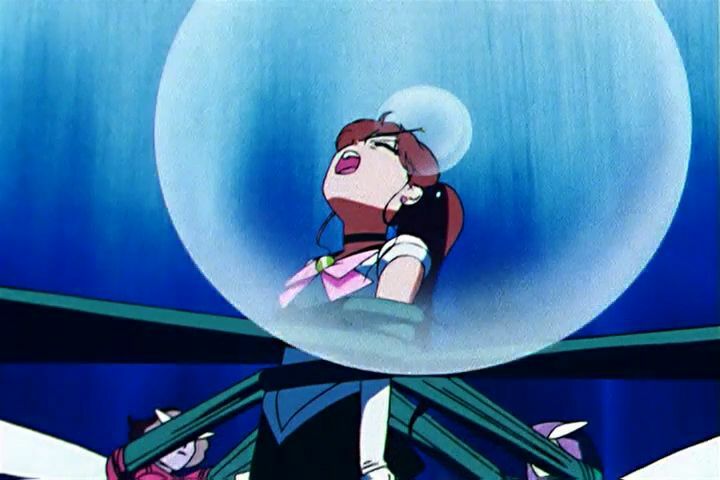 Other examples of instantaneous transformation are 1×28 where Ami, Rei, and Makoto are contacted by Usagi on their communicator, she tells them a monster has appeared and by the time she completes a second sentence that she needs them there, they have already transformed when they reply to her. Tuxedo Mask also does an instantaneous flash of light transformation in one of the early episodes before Mamoru knows his own double identity. There are also plenty of times that the Senshi are already in the process of being attacked when they transform. One of the most obvious is of course the elevator scene in 1×34 where Zoisite’s fire is already hurtling at her where no way did she have nearly 40 seconds until it reached her from the time she decided she had to transform! Another example is 5×29 where the Three Lights transform as Tin Nyanko launches her attack and are done and able to counter it before it hits. Sailor Moon has also transformed in the same instant that the two attacks meets (she doesn’t get a sequence). Plus considering that the Senshi seemingly summon/send objects they are touching to/from somewhere else like obviously transformation rods, Sailor Moon’s weapons (remember she even kept the Moon Stick after detransforming), their civilian clothes (not even just standard transform/detransfrom but in 5×25 Rei/Minako were apparently able to re-summon the video-game cosplay outfits they had on while still transformed as Mars/Venus!) , and even just random stuff they were holding pre-transformation such as the daifuku Usagi is holding pre transformation in 1×30, then not holding, then holding again to offer Rei before they disappear one more time until the end of the battle. So if they can move other objects to and from this other dimension/space at will does it not make sense that they could indeed potentially enter it themselves in order to transform? Likewise we know that together they can teleport great distances, and that Tuxedo Mask (the sorta Earth senshi) can teleport short distances on his own (like when he teleported in front of Sailor Moon from standing behind her to intercept Zoisites attack in 1×34), I’m pretty sure we also see him start to teleport during his involuntary transformation sequence. So if Tux can do it, then it seems not unreasonable that the others could potentially as well and it would certainly explain their propensity for getting to high places unnoticed for their intros (or Usagi getting below the stage that fast in 2×10) as well as always being able to arrive to conveniently help each other out at the right moment in battle when they weren’t seemingly nearby before and would otherwise need blind luck to know where to go. I guess part of that is that the attacks are all in English, so they sound somewhat exotic to a native Japanese speaker — problem even more so to junior high school kids who are just starting to learn English. There’s a fun Japanese blog that does literal Japanese translations of the attack names, and the author comments on how dumb they sound in Japanese. Your website is the BEST sailor moon website on the www! Thanks for the comment! I’m always happy to hear that at least some people enjoy reading about these rambling research projects. Looks like I was half-right! I had always headcanoned that it was a way for them to focus their energies when attacking. It’s interesting hearing about the cultural aspect of it as well. I’m also glad I’m not the only one who used to go around yelling these things out. I remember I would always yell “MOON PRISM POWER!” every day before I got dressed for school (complete with holding my hand up, lol), and that when I got home I would throw around a frisbee yelling “MOON TIARA MAGIC!”. I know that attack and transformations are pretty common in anime and super sentai shows, but I have to say that one of the (many) things that Sailor Moon did oh-so-well is that the attacks used in that show were just SO. DARN. CATCHY! YES! I’ve seen a lot of anime and super sentai series throughout the years, but no transformation and attack calls have managed to beat Moon’s for me. They almost have a sort of musicality to them, with how well they roll off the tongue. Late to the party and don’t mind. It’s pretty reminiscent of AD&D, as spells generally had a Material, Verbal, or Somatic component required in order to cast them. This was 2nd Edition, it carried over to 3rd and 3.5; anything beyond that is not my realm to know. So your material aspects are a requirement for actual transformation. For attacks in the manga, Venus had her belt, Jupiter her tiara generated lightning rod, and of course Sailor Moon for her tiara and numerous rod/staff collection that helped to generate/focus the attack. The Outers stayed the same, their talismans/World Ending Items stayed the same for both manga and anime. Moving to the 90s anime, Jupiter’s tiara lightning rod stayed and still, the armory of things for Sailor Moon seemed to be present. Crystal … hehe ok I’ll leave that be. That leaves you with Verbal and Somatic components. You said words to focus the energies required (pending your class said how and where they came from), and sometimes you had to do a gesture to accompany it. Sailor Moon and company do the same, from the shouts and whispers to the waving arms, pointing fingers, and the whole host of other ways you can move your limbs about. Were super sentai shows and anime influenced by Dungeons and Dragons? Always a possibility.